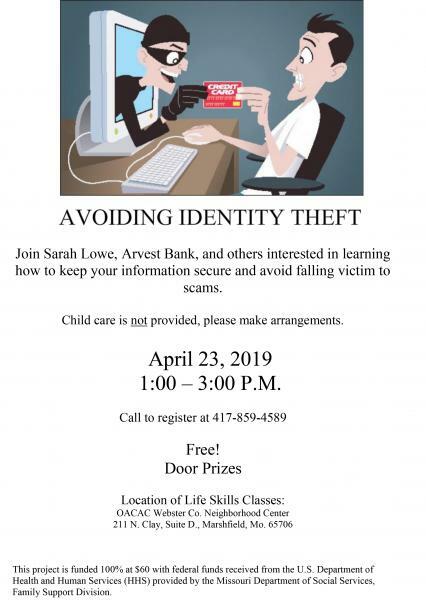 Join Sarah Lowe, Arvest Bank, and others interested in learning how to keep your information secure and avoid falling victim to scams. Child care is not provided, please make arrangements. April 23, 2019 1:00 – 3:00 P.M. Call to register at 417-859-4589 Free! Door Prizes Location of Life Skills Classes: OACAC Webster Co. Neighborhood Center 211 N. Clay, Suite D., Marshfield, Mo. 65706 This project is funded 100% at $60 with federal funds received from the U.S. Department of Health and Human Services (HHS) provided by the Missouri Department of Social Services, Family Support Division.